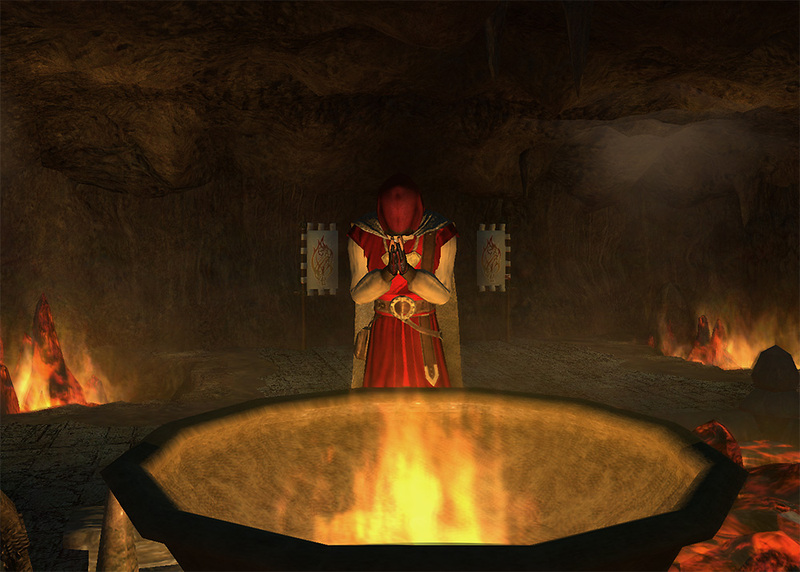 A hooded man in crimson robes adorned with intricate embroidery stood facing the ever-burning cauldron, head bent as in honoring The Flame, as the Devoted Flame of the Tendrils returned from chambers, headed back to his ever present post within The Temple. A pause, in the silence of the room, with only the ever-present crackle and flare of smouldering coals within the great purifying pit, to disturb the air that hovered between the two men. The hooded figure raised up his head slowly and only slightly, not in a way that he would only now be aware of the presence of the returning priest, but slowly as to let the priest know, the hooded man was not unaware. The Tendril priest's eyes burned into the back of the hooded man, seeking illumination into the identity of one that would face The Flame without any appearance of respectful fear. "Let fire and purity bless you, my son...." spoke The Tendril priest, clearing the air, attempting to deduce the purpose of this new arrival within the temple. The hooded man, reacting to the spoken words, turned with a powerful grace, smooth like a bending flame around dry fuel, consuming the form in its caress. 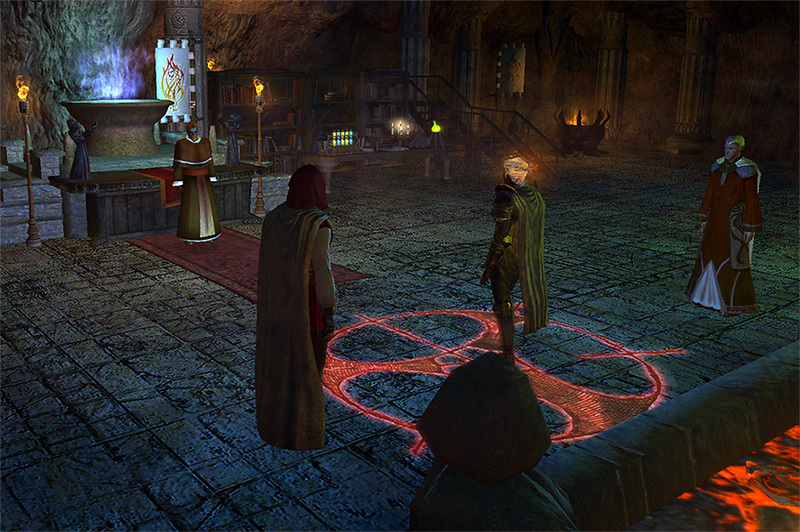 As the hooded man finally faced the The Tendril priest, hands moved to open showing palms, where in each, new and separate flames flickered to life, blazing crimson and casting powerful shadows around the man. "And the Eternal Flame shall purify us all." now answers the hooded man with hand aflame, a response made in harmony to that which was first spoken by the Tendril priest—a call and response, between the Knowing. "Preceptor Zau...your arrival was foretold...."
Last edited by Steve on Sat Apr 21, 2018 12:02 pm, edited 1 time in total. 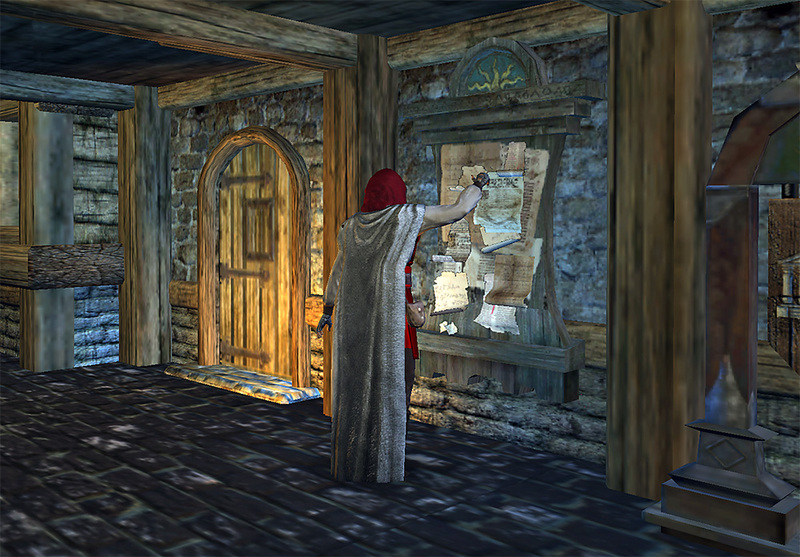 In the town of Beregost, upon the boards carrying notices and public announcements, one more is added to the depth. Lies every virtue, every custom of balance. For still...some men deny you, others say you care not for salvation. Is drawing near when a challenge shall test the value of all. And opposite them your faithful seek that higher state. That makes my heart consume itself with scorn? The rabble follow and the blind world loves! All the while your faithful are expelled from land to land? And those who best are skilled in unpure deeds. And never will return to its great office. With pain, the gain of avoiding further ruin! Each one does what he can to do to purify. Those past times, once chaste and pious, long past, shall return. Be it faith or philosophy. No-one is on the straight path any more. And for what good does good no longer do! And who did raise his weapon against ambition. Last edited by Steve on Sat Apr 21, 2018 12:03 pm, edited 1 time in total. 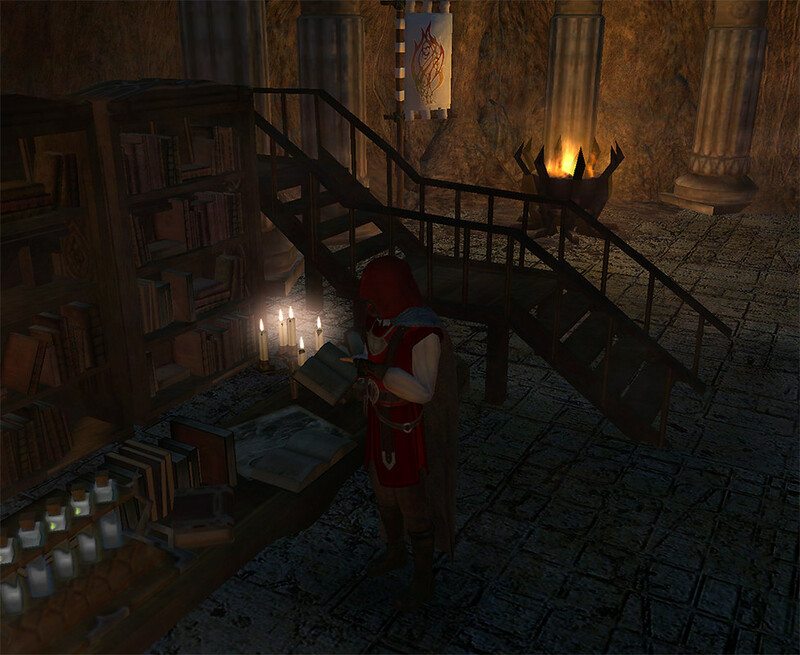 The Preceptor takes hold of one of the ancient tomes detailing the history of the Pure Flame...and the words carry the candle-flame like inked pillars of truth. With regard to water that flows...such it will one day be made into steam. And through the impurities of the material, it is cleansed by the flames. Reward of successful ambition is power. And that is why we do not fear it. The eternal Kossuth sends his pure fire to cleanse us all and temper our souls to a more pure state. Expect to be tested and strive to rise to the challenge, no matter what difficulty or pain it brings you. Follow the Promised above you, for they have proven their worth and achieved a higher state which you too can find in Kossuth's service. Find the true vision, the final goal of your life, and pursue it utterly. Give yourself totally to the cause, and it will return eternal rewards to you. Guide the teeming masses to the pure light that is Kossuth so that he may reforge all life into its essential form, and complete order and harmony will follow. The Preceptor practices his lesson, over and over, before the burning cauldron—a witness within the flame, ever present. "Awaken the to the pure light that is Kossuth, so that he may reforge all that is lived yet wasteful, back into its essential form...and complete order, and harmony, will follow." This the Preceptor repeats, developing into mantra-like form, until by will and devotion, flame from the cauldron leaps from basin into the Faithful's own hands...so empowered. DM Dagon wrote: The strange affliction rages on in Amn, and now rumors say that there are already around seven victims of it confirmed, found in their homes dead or disappeared during nights. All of the victims are from the poorer inhabitants of the two towns. 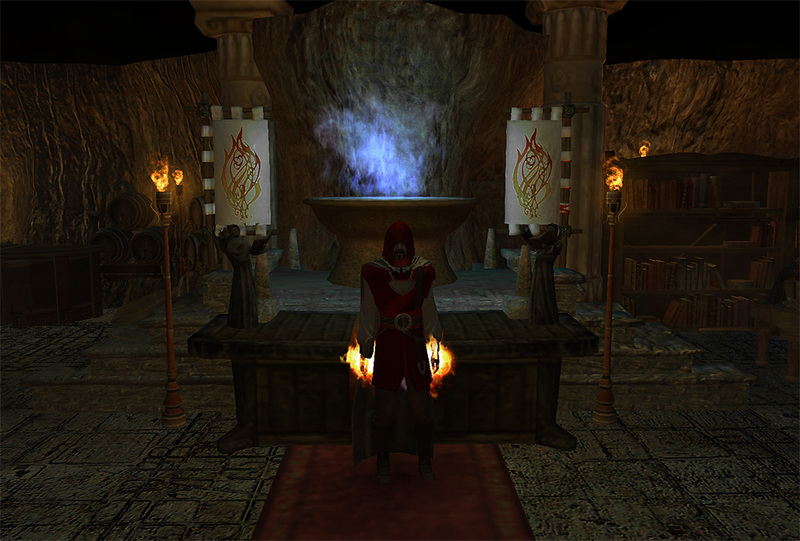 A red hooded man in red-dyed cloth embroidered with thread shaped in flames, was overheard commenting in the public plaza of Beregost, that it would only be purification by the Eternal Flame, that would cure the strong and release the weak, from whatever suffering has placed upon the people, by the Gods. Some may speak that the Man himself, was able to envelope his hands in a flame, and offer to administer the Purification, personally. If any of the commoners would have showed fear from the Man's power, he would have, as calmly as possible, assured them that this Purification was a gift, and that only through submission to such purity as flame, would they know a life lived of least suffering...or, did he mention no life to suffer by, should the Flame decide? The rumors ended with assured tones that the Man bringing offers of purification came and went eastward, past the road leading to Gullykin.